“This new Polytrauma-Blind Rehabilitation Center will allow VA to better serve our Veterans and active duty Servicemembers in a state-of-the-art facility, which will support the exceptional clinical care currently delivered through both programs, ” said Secretary of Veterans Affairs Eric K. Shinseki. Providence, RI – Nominations are now being accepted by the U.S. Small Business Administration (SBA) for the 2012 Rhode Island Small Business Person of the Year and other small business awards. Winners will be honored during the Rhode Island Small Business Week celebration in June. Awards will be presented in 10 categories. Any individual or organization dedicated to the support of the small business community may submit nominations for these prestigious awards. Award guidelines and nomination forms are available from the SBA Rhode Island District Office by calling (401) 528-4561, or by visiting the SBA Website at www.sba.gov/ri. The Nomination deadline is Thursday, November 10, 2011. The other awards include: Entrepreneurial Success Award, Jeffrey Butland Family-Owned Business of the Year, SBA Young Entrepreneur of the Year, Small Business Exporter of the Year, Financial Services Champion, Minority Small Business Champion, Veteran Small Business Champion, Home-based Business Champion, and Women in Business Champion. The Rhode Island Small Business Person of the Year will also have the opportunity to participate in the National Small Business Week activities and meetings with government officials in Washington, DC, and will compete for the National Small Business Person of the Year Award. Champion awards are presented to persons who have used their professional skills or personal talents to further public understanding and awareness of small business. Candidates must have taken an active role in creating opportunities to promote the interests of small business. Persons nominated for Champion awards need not be an entrepreneur. For more information about the SBA Small Business Awards, contact Faith White at (401) 528-4561, or by e-mail at faith.white@sba.gov. 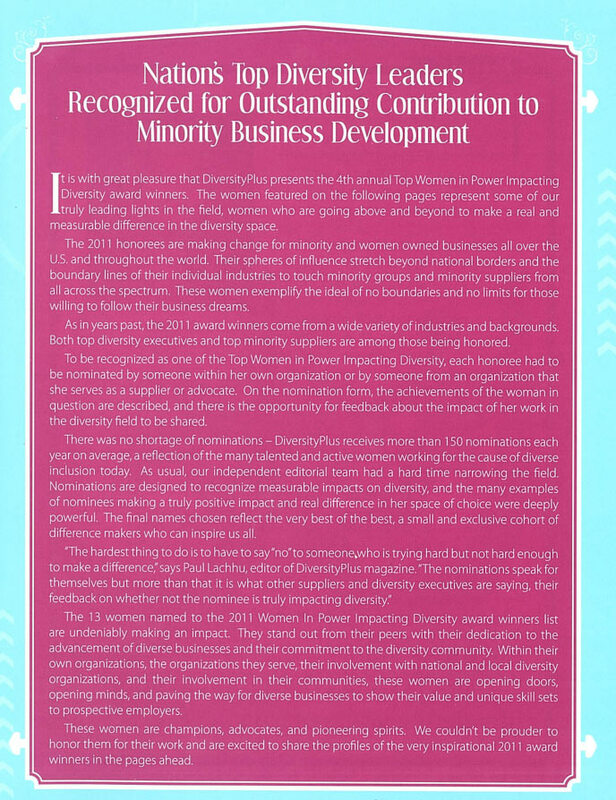 VAMBOA would like to congratulate Wendy Matheu for being named one of the DiversityPlus Top Women in Power award winners. 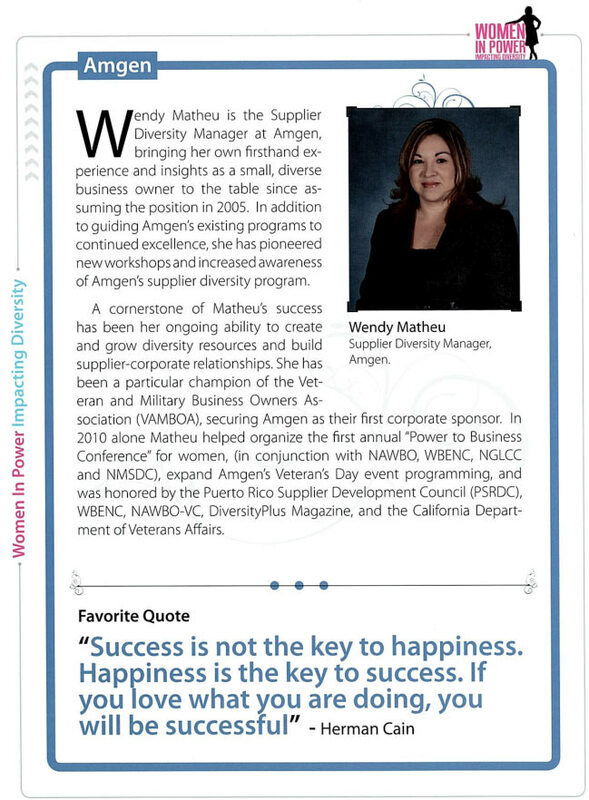 Ms. Matheu, the Supplier Diversity Manager at Amgen, was responsible for Amgen’s sponsorship of the Power Your Business Conference in April, and she also served as Emcee of the event. There hasn’t been a better time for securing government and corporate contracts if your company helps meet diversity requirements, but that doesn’t mean those business owners can sit back and wait for customers to come to them. Instead, those small business owners need to pursue certification, register as potential suppliers with organizations and companies, and do their research — on the contracts they are pursuing, on their competitors’ capabilities and on what they can offer to set themselves apart in an increasingly competitive market. That was some of the advice speakers offered and repeated throughout the day to the roughly 200 people in attendance at the “Power Your Business” supplier diversity conference at Amgen’s conference center in Thousand Oaks on Tuesday. The day, which targeted minority, women, veterans and gay, lesbian, bisexual or transgender business owners, covered topics from securing government contracts and corporate business to personal finances. 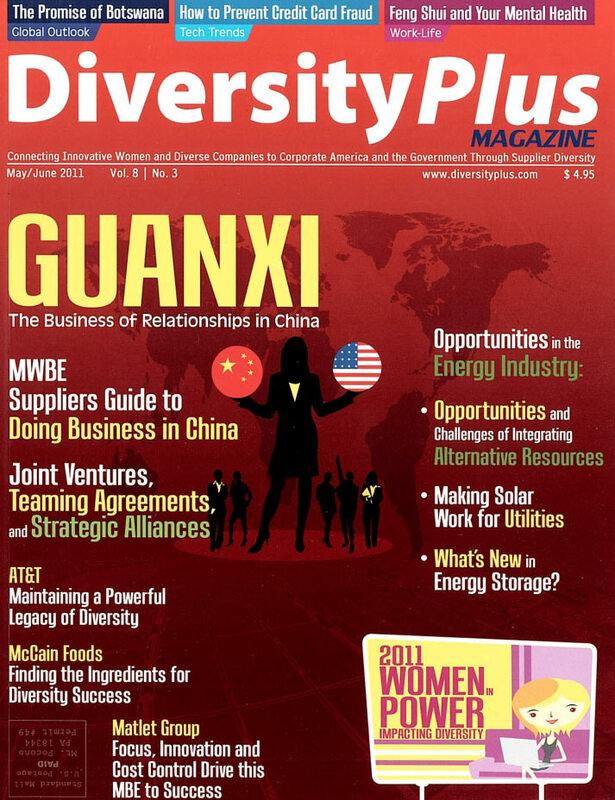 There are legal requirements in place that drive certain government agencies and corporations to pursue diversity in supplier relationships, but that’s not all. Johnson Controls, which has spent more than $1 billion each year since 2002 with woman- and minority-owned suppliers, pursues diversity because it strengthens the company’s supply base, makes it a good corporate citizen and builds the bottom line, said Lorenzo Bell, supplier diversity manager for the company. It also lets the company differentiate itself when it approaches its own customers in the automotive, battery or building efficiency industries, he said. Corporate representatives said it was important that suppliers have certification that recognizes that they meet the requirements as a minority- or woman-owned business. 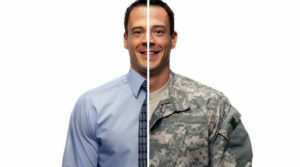 For veterans, certification is a more muddled process, which includes certification through Veterans Affairs to handle certain government contracts; through state programs, which aren’t recognized at the federal level; and through the Small Business Administration. That can be a challenge and a headache, as some attendees noted their own experiences with the lengthy process and dismay at not having a single certification recognized across agencies. There are efforts, such as a single website that would pull together information from across departments and agencies for veteran entrepreneurs, that might help, said William Elmore, associate administrator for veterans business development for the Small Business Administration. Being certified as a minority-, woman-, veteran- or LGBT-owned business is a quick way to show that a business meets all of the requirements of that certification, but business owners should take advantage of other resources available through the certifying organizations, such as trade shows, networking and directories, said Candace Waterman, senior director of compliance and alliance relationships for the Women’s Business Enterprise National Council. Other speakers agreed that the certification is necessary, but it’s not what gets a foot in the door as a supplier. That comes from setting the business apart from the competition, building a relationship with companies and agencies and honing — and specializing — a quick pitch on what the company can do based on the demands of the contract. Diane Esqueda is an account manager with Agnew, a translation agency based in Westlake Village that is WBENC-certified. Esqueda said certification often is the added element needed for the opportunity to bid on an account. She and other attendees said they were at the conference to learn information that would help their businesses and network with others. “Amgen is one of our clients, a number of organizations here presenting are our clients and the room is filled with potential clients,” she said. Pursue certification as a way to help you land business and help your buyers meet their diversity requirements. Do your research. Know the company or the government contract you are pursuing and be able to say how your business can meet their needs in ways different from your competitors. Tailor how you pitch your business to each individual contact. Highlight capabilities that meet their needs. Know the lingo of the industry or agency. Be able to point to specific projects that are similar to the one you are pursuing and offer to share how your company did that successfully. Register as a potential supplier. This is often done online at corporate websites. Complete the registration, or risk being passed over when the company doesn’t have all of the information it wants when looking at suppliers. Be persistent. It could be a year or two before a company or agency needs what you have, but you want to be the first in mind when that happens. Know what is important to the company or agency. Is it risk-averse and needs to see your level of expertise? Does the company need you to be flexible and able to react quickly to change as well as make improvements? Revered by many to be a man of great integrity and worth, Lt. Colonel Tom Lasser was recently named “Veteran of the Year” by Assembly member Ted Lieu at the 3rd annual Veteran of the Year ceremony. Our own Co-chair, Debbie Gregory, is a long time friend of Lasser and was happy to hear the news of his award, citing his deserving of it because of his “24/7” work ethic and all around good will. Lasser’s 7 years of active duty service and 33 years spent with the California National Guard might speak for themselves, but after 40 years of veteran service, this award is a long time coming. Lasser is a Vietnam veteran who earned his Army aviator wings upon completion of the Army Aviation Warrant Officer Aviator Flight Course. He is a brightly decorated war vet, earning the Purple Heart award, the Legion of Merit, the Distinguished Flying Cross, the Air Medal with 35 Oak Leaf clusters, the Bronze Star, Meritorious Service Medals and many other awards and commendations. He is a master Army aviator with more than 1000 Vietnam helicopter missions and over 6000 total flying hours. It is no wonder why someone with such impressive experience and impenetrable devotion to his country would be recognized with an award of this nature. Lasser is truly a role model for American veterans. Lasser has resided in Redondo Beach with his wife for 20 years. They have a daughter, Ami’ Collette, who works in the fashion industry in Hollywood. Tom Lasser is a proud veteran business owner.